Redis is a fine in-memory database which can act as the glue for your entire stack. If we were to pick a missing feature we'd really want though, it's the fact that it is essentially built for inside the private network and connections to the outside world are unencrypted - Redis doesn't handle SSL/TLS connections, at least not yet, and its authentication is as lightweight as it is, so the only real solution is to use SSH tunnels to connect to it. That's exactly what we've just enabled at Compose too. So if you want a more secure Redis, read on. First check you haven't already got keys. Open a terminal and run ls -la ~/.ssh which will display the keys already generated. You want to see if there's an id_rsa.pub there. If there is, you've already made a key and - providing you remember the passphrase you set for it – you should skip to the "Turn on the SSH portal" section below. For the rest of you, it's time to cut some keys. ssh-keygen -t rsa -C "your_email_address"
You'll be asked where to save the key, just press enter for the default. You'll then be asked for a passphrase. Choose a strong phrase – ideally a reasonably long one too. Once you've entered it, hit return and enter it again to verify that you actually entered what you think you entered. The key generator will then start up and will write out two files, id_rsa (the private part of your key that you hold on to) and id_rsa.pub (the public part you give to other people). Now we are ready to turn on the SSH portal. You'll see where the keys come in later. 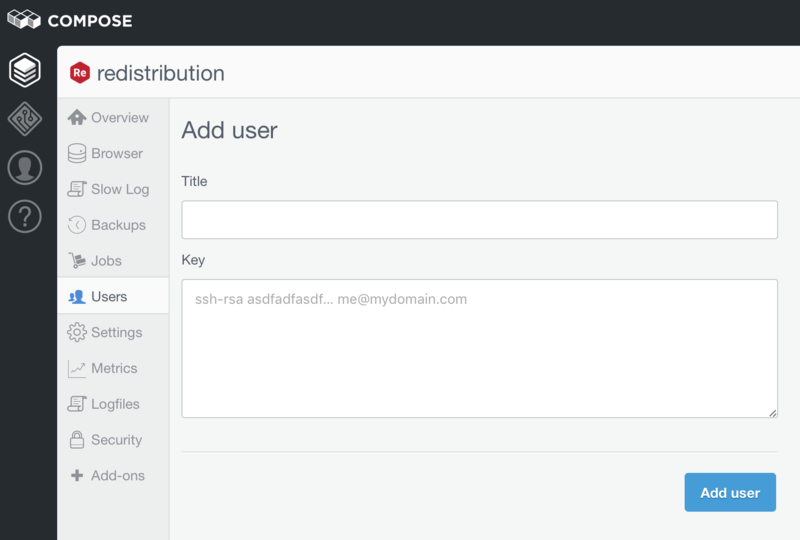 Log into your Redis Compose console and select Security. On that tab you'll see two access portals, the TCP portal which you probably already use, and the new SSH portal. Select On for the SSH portal and then Set Active Portals. The SSH portal's cost is displayed in the sidebar on the right and is currently billed at $4.50 per month. This will activate the SSH portal but it will not allow tunnels to be created to it yet. For that you'll need to create a "user". The Title is a descriptive name for your user for your reference. It isn't used anywhere but for you to know who's keys they are so make sure it's unique. To copy the file to the clipboard and Control-V to paste it in. Or you can just display the file in the terminal and cut-and-paste the output into the text area. The public key begins with ssh-rsa and a space and then is one long sequence of various characters ending in another space and finally the email address you used when you created it. You'll need all of this text, including the ssh-rsa and email address when you copy and paste. When you've got that in click the Add user button and your new SSH user will be created. And if you look down the list, you'll find 10.0.26.101 belongs the TCP haproxy portal which handles the normal unencrypted traffic. It has another attribute which is that it can forward traffic to whichever Redis is leader, which is why the SSH tunnel forwards traffic there. Now you understand what the command it doing, let's run it. You'll be asked to confirm the machine you are connecting to is the one you expected and give the password that you gave when you generated the SSH key earlier. That command will now hold open the tunnel, so go to a new terminal. 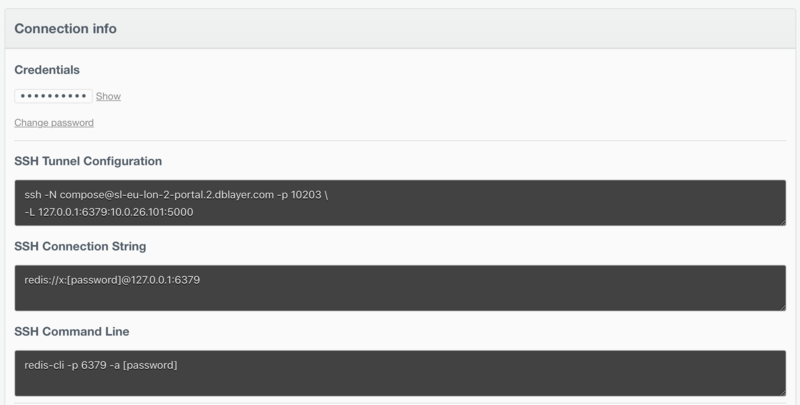 While we have a secure connection to the Redis database, the TCP haproxy portal is still accepting connections from unencrypted clients. Now, you may want this configuration or, more likely, you will want to ensure that only connections from the SSH tunnel are accepted. If that's the case, then the next steps are simple. Although we can't turn it off, we just need to stop the TCP portal talking to anything but the SSH tunnel. We can add a description for the IP address we're adding; it's purely for information purposes. The important part is the IP address which we can get from the Deployment Topology chart earlier. The SSH proxy has an IP address of 10.0.26.102; your proxy will obviously have a different address, but whatever it is enter it and click on the Add IP button. Now, connections can come only through the SSH portal. The whitelist will block any other connections from other IP addresses. Things will work through the SSH tunnel, and you can set up multiple SSH tunnels between sites. 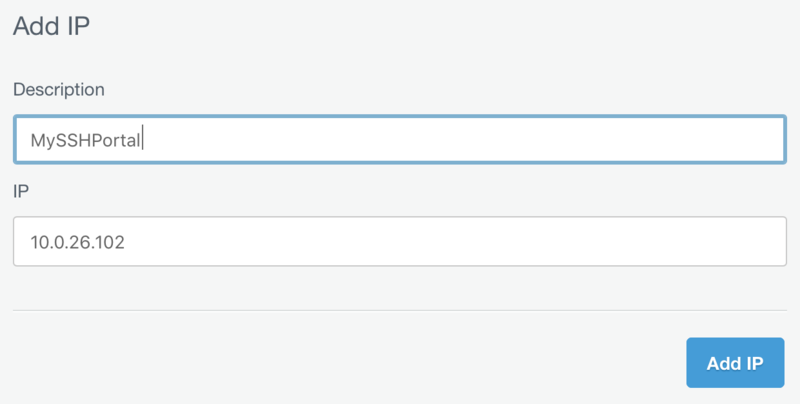 Click the button to whitelist the Compose services and you'll be good to go with Redis and SSH tunneled secure connections.